Who says fashion has to cost a fortune? That is the idea behind Paparazzi Accessories mission to help women look and feel fantastic every single day! Paparazzi Accessories made headlines when they exploded on the direct sales scene with their trendy, fashion-forward accessories – all for just $5.00 a piece! Want a matching necklace for every single outfit in your wardrobe but don’t want to break the bank to have it? Paparazzi makes it easy to have a fresh new look every single day, for about the same price you spend on a gourmet cup of coffee. Though our fashion-forward jewelry and product parties are centered on fun, Paparazzi fulfills a serious mission. We believe that trendy accessories can be available, and affordable, to women everywhere. We know that wearing a new look, and feeling confident in your appearance, builds amazing self-esteem. Our passion is inspiring dreams, empowering talents, and reaching goals by sharing our products and the excitement of Paparazzi. We see it happen every day. All of Paparazzi’s products are lead-free and nickel free so even Littlest Diva can wear them with her sensitive skin. You can earn free and discounted products by hosting a party in home or online and sharing these beautiful and affordable accessories with your friends and family! With these prices, it is easy for everyone to stock up – and you will reap the rewards! The Paparazzi Accessories Business Opportunity is unique in that it offers you the chance to really be your own “boutique” with items on hand for “cash and carry” meaning immediate revenue for you, and no hassle of inputting customer orders, party orders etc. You can sell where you want and how you want – whether that is at a party or an expo or just one on one. You can even have your own online boutique where customers can shop their favorite styles 24/7! There are three starter kits for you to choose from which all come with jewelry, business aids, jewelry displays and more! Independent Paparazzi Consultant Heather King McKeever sent in a beautiful piece for inclusion in this year’s Diva Holiday Gift Guide. 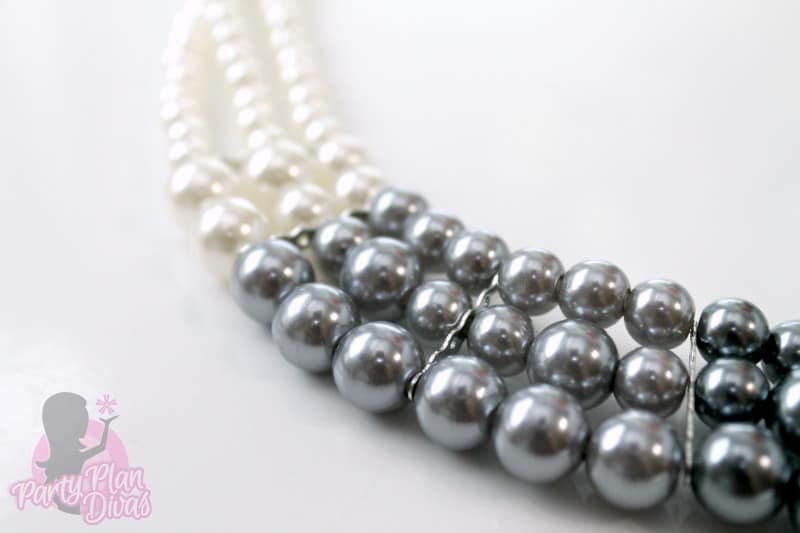 The Lady In Waiting set has strands of white, silver, and dark gray pearls elegantly drape below the collar, creating a beautiful ombre effect. 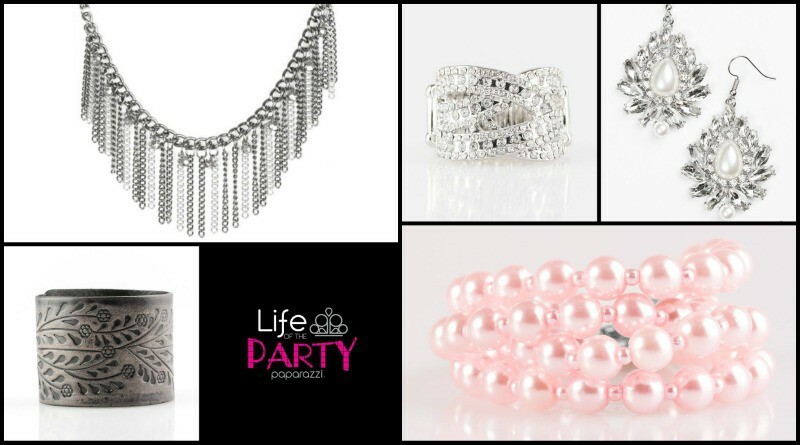 Modeled By: 2018 Life of the Party Members with Diamond Access, Lisa A., Rochelle B., and Beatriz V.
Sectioned by silver accents, the luminescent pearls radiantly fall into a glamorous cascade. 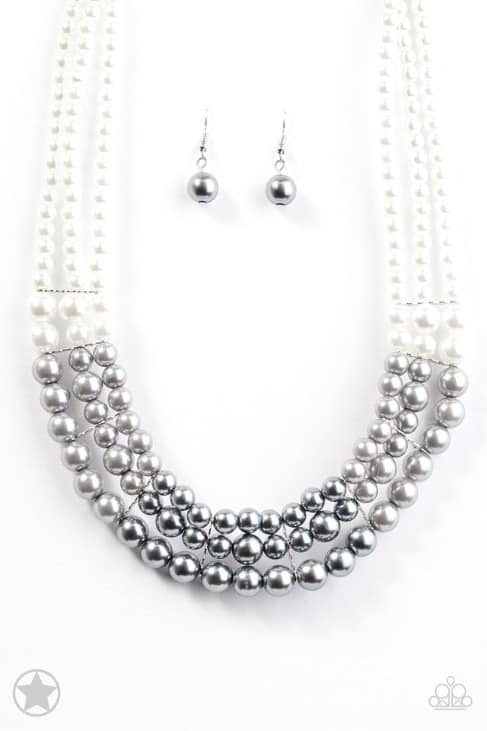 It is hard for pictures to justice to how pretty this necklace is, and the dainty little drop pearl earrings give the perfect accent to this statement piece. It is hard to believe this set – the necklace AND earrings – are only $5! I love Paparazzi! Check out Heather’s website to learn all about how you can get involved with Paparazzi! I am so excited to offer one of my lucky readers your very own Paparazzi Lady In Waiting set from Independent Paparazzi Consultant Heather King McKeever. You can enter using the RaffleCopter widget below! Good luck!